Thirty-two ! That’s the number of times that Delphine and Nicolas, Ideas Box facilitators in Marseille with the organization, ACELEM, uttered the word “wish”, in thirty minutes of dialogue. The wish to learn, the wish to discover, the wish to share. Let’s take a look at their “outside the walls” activities for the youngest children, where books are always at the heart. 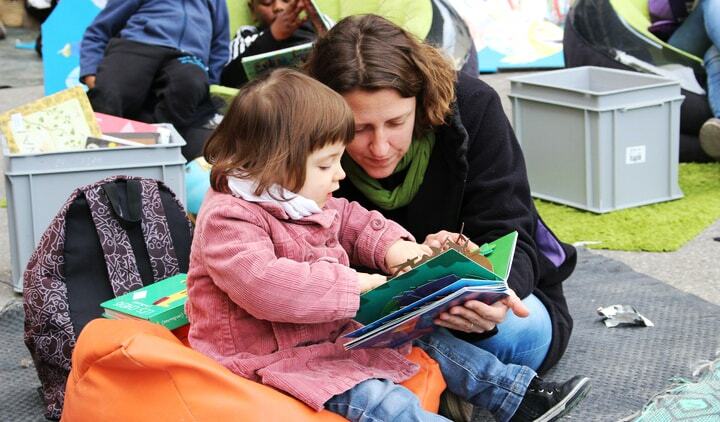 Since 1995, the Cultural Organization of Reading and Writing Spaces in the Mediterranean (Association Culturelle d’Espaces Lecture et d’Écriture en Méditerranée or ACELEM) created places of cultural enjoyment focusing on books in Marseille, fostering reading and writing for people far from public reading organizations. With its eight Reading Spaces, local structures installed in different neighborhoods of the city from Air Bel to Valbarelle, ACELEM offers veritable resources for partner society groups and inhabitants: book-lending, news access, multimedia workshops, and writing activities. “Outside the walls” actions are also led regularly in schools, high schools, Homes and social centers. 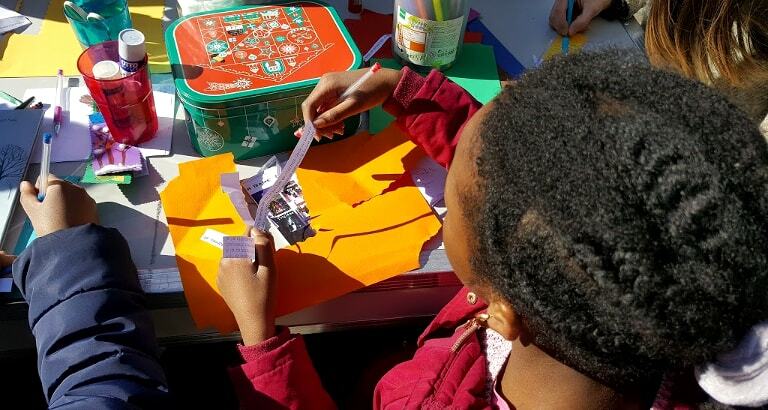 In partnership with Fondation Cultura, these Ideas Box activities have been taking place for over a year. “The Ideas Box allows the creation of a bridge, a cultural dynamic and social link between people. It is a neighborhood meeting space and allows us to make young people discover things that are out of the ordinary. They’re not at school: we’re not out to grade, evaluate or rank. Each person can express him or herself and learn how he or she likes. We’re simply involved in the sharing of knowledge. It’s a cultural exchange, and we’re on equal terms,” explains Nicolas. 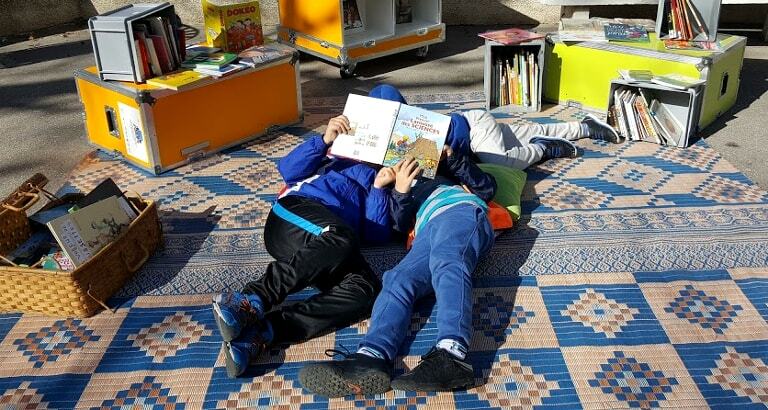 Two to three times a week, the ACELEM facilitators – formed by the teams of Bibliothèques Sans Frontières – develop many book-related activities in the street, the squares, the closest they can get to inhabitants. “At ACELEM, the book is at the heart of our intervention. For every creative workshop, writing or reading, we always rely on books, stories with poetry. We’re trying to desacralize the book as object, to make it more fun, theatrical and shared. Our goal is that children take ownership, that they feel like reading. If we are involved and tell stories, that will make them feel like doing it, too!” emphasizes Delphine. “One part is to desacralize, but the other part is to re-sacralize. In order to make young people realize that the object is precious. I’m thinking specifically of pop-up books, animated books whose page elements move. The manner in which we position ourselves matters enormously: we can interest children in books if we grant them a lot of importance within our activities. Even if they have difficulties reading, it’s in appropriating the story and characters that they will tell stories in turn to their friends,” continues Nicolas. A theme linked to reading and writing often serves as the common thread throughout activities, sometimes for several months. The latest one: Japan! “We have specifically worked with calligraphy. On the Ideas Box television, the children were watching a little film on the calligraphic gesture. Then with a backdrop of Japanese music, the calligraphy workshop began: they sat on the floor and drew with beautiful paintbrushes and Chinese ink,” remembers Delphine. “We have also made kamishibai, traveling theater where the artist tells a story while parading around illustrations in front of the audience. It’s another way of reading. The book, transformed into a show, suddenly becomes more fun. It joins children together: they approach, observe and want to read themselves,” adds Nicolas. In places where few means are invested for public reading, where many inhabitants are far away from cultural spaces, Delphine concludes with the importance of these open and convivial spaces.